proofreading much? 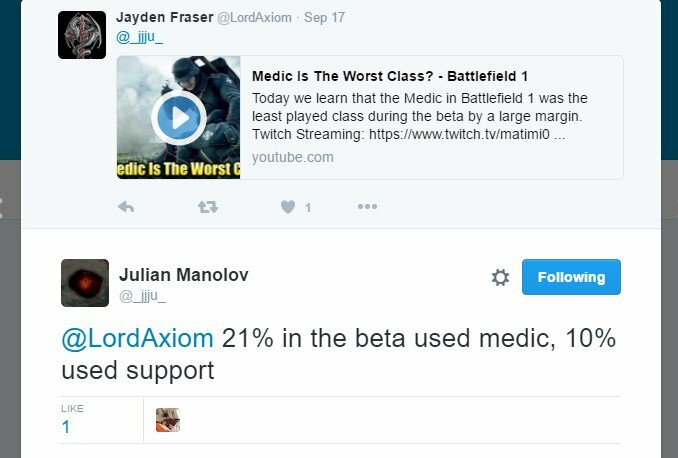 why would they say in the infographic that medic was the least used class if it's the opposite? Social Media isn't exactly something I trust, especially from a "big" YouTuber's twitter like Matimi0. It's miss information is what that is, and the followers happen to believe that miss information. Words get used the wrong way. matimio just said what the infographic said, but nobody bothered to check the infographic was correct at dice/EA. Okay. yeah I was one of those losers that loves Support. I loved it most of the BF games even though I always end up salt-whoring but hey Support is a good thing! Its one of the worst infographics I've ever seen, even without the idea that it's information is wrong. The only part of it that conveys info in a way that isn't plain text is the "pie chart" deal about class play time.